Explore volleyball positions - from Libero to Opposite Hitter. Learn to understand the basics of volleyball court positions - from position 1 to position 6. On this page we present volleyball playing positions (libero, outside hitter etc). If you were looking for rotational positions of volleyball (position 4, position 6 etc) and how players should line up, go to "6 positions of volleyball" page. The link is in the end of this page. Volleyball court divides into attack zone (front row) and defense zone (back row). There are three players on each of the zone. Front row players are players who are allowed to block the opponent and attack the ball in the attack zone. Back row players are players who play defense by digging opponent’s attacks and attack the ball behind attack line (3 meter line, 10 feet line). Players are rotating clockwise on the court after winning the rally after the opponent’s serve. Players have rotational positions (position 5, position 2 etc.) on the court from which they are allowed to move to their playing positions (opposite, middle hitter etc.) after the serve when appropriate. Volleyball positions on the court can also be called zones. Position 4 being called zone 4 etc. Outside Hitter is the player who carries the serve receive responsibility along with the libero. Outside hitter most often attacks the balls which setter sets to the antenna to the left side of the court. Therefore after the serve outside hitters place themselves to the left front position. Sometimes setters run offensive plays in which outside hitters run to hit balls “inside” around the middle blockers. Outside hitters play both the front row and the back row. 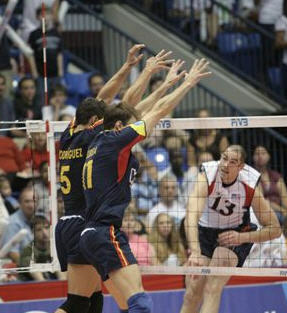 In modern high level volleyball outside hitters are responsible for hitting the 3 meter or 10 feet line attacks, usually from the middle back position when playing in the back row. Playing on the outside hitter’s position requires great all around skills because they play through the front row and the back row. Wing spikers have to have the skills to pass, attack, block, serve and play defense. Wing spikers along with the opposites are often players who score the most points in the game. Outside hitter’s passing responsibility makes them extremely important player for the team. Right side hitter has the similar role than outside hitter, they play front row and back row and are carrying pass, attack, block, serve and defense responsibilities. Right side hitters aim to place themselves to the right front playing position. When playing top level international volleyball on the back court right side hitters often have 3 meter or 10 feet attack responsibility from the middle back position. Right side hitter can be also called a wing spiker. The opposite hitter is the player who most often scores the most points in the team. Opposite hitters don’t have the passing responsibilities. They stand behind the passers on the rotation while libero and outside hitters pass the ball and place themselves to the left front, right front or right back playing position. The opposite usually get the most sets in the game. Often counter attack sets after the defensive play go to the opposite hitters - they carry the responsibility of hitting the ball against a solid block when the pass is off the net. Opposites need to have great blocking skills since they play against the opposite hitter of the opponent or opponent's outside hitter when in the front row. Opposites also need to have defensive skills because they also play the back row where they are responsible of hitting 3 meter or 10 feet balls from the right back position. In professional volleyball opposites along with setters have traditionally been the highest paid individuals - those are volleyball positions in most demand. The setter is the playmaker, point guard or the quarterback of the volleyball team. A setter’s responsibility is to run the team’s offense and build up offensive scoring opportunities for the team. 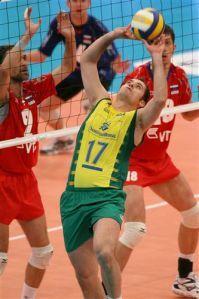 The setter plays both front row and back row, therefore s/he needs to be able to block, serve and play defense. The setter needs to have good blocking skills because in front row position s/he plays against the opponent’s outside hitter who often carries big load of the attacking responsibility for the team. Middle blockers main responsibility is to stop the opponent’s offense. The middle blocker builds a block which stops the ball, or allows the team to dig the ball up. Middle blockers' job is to stop the opponent’s middle hitters or wing hitters in co-operation with teammates. Middle blockers need to have great blocking, attacking and serving skills. In competitive volleyball middle blockers usually play defense only on one rotation - after an own serve. After losing the rally after an own serving turn, a libero usually comes in and replaces the middle blocker. The middle blocker usually don’t master in defense because they hardly play any of it. However, at junior level practicing defense and even passing is very recommended for the middles. Junior coaches should allow players to practice all the skills equally to ensure their overall skill development. This improves their athleticism and prepares players to play other positions - i.e. they may not be tall enough to play middle in the future. The libero is fairly new position in volleyball. The libero is a back row specialist who is allowed to play back court only. The libero wears a different color shirt in the team and is allowed to enter and exit the game without substitution request. The libero can replace any player on the court and most often replaces middle blockers. Since playing in the back court only, the libero needs to have the best passing and defensive skills in the team. The libero need to have exceptional serve receive skills because often they pass a larger area than other serve receivers in the team. Libero most often plays the left back position. Most leagues in United States allow unlimited substitutions; therefore very often in the team there are defensive specialists. Defensive specialists in US enter the game to replace players who in international volleyball would be playing both the front and the back row. Defensive specialists carry a serve receive and defense responsibility in the back row. Defensive specialists are allowed to serve and often play the full back row rotation before giving the spot in the front row to the offensive player again. Check out six volleyball positions page to find out how players should line up on the court.